The entrance exam is conducted annually for granting admission to students who wish to pursue their post-graduation diploma course from the Asian College of Journalism (ACJ). Asian College of Journalism is dedicated to the task of producing such journalists. It is a postgraduate college designed to provide students with excellent journalism education adapted to the specific needs of India and other developing countries in Asia. 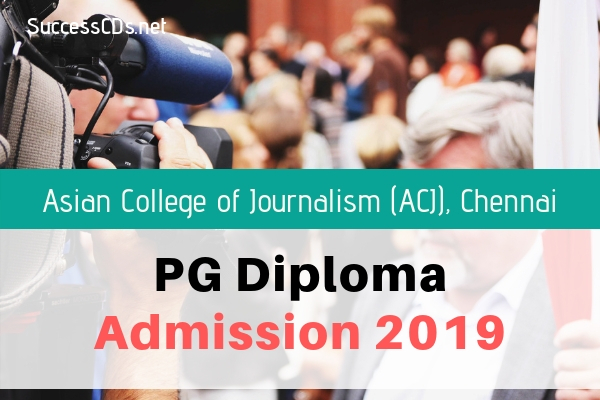 Candidates can get complete details about the Asian College of Journalism (ACJ) Entrance Exam 2019 on this page below. Ahmedabad, Bangalore, Bhopal, Bhubaneswar, Chandigarh, Chennai, Cochin, Guwahati, Hyderabad, Jaipur, Kolkata, Lucknow, Mumbai, New Delhi, Ranchi, Patna, Pune, Thiruvananthapuram. Application whether online or hard copy will need to be sent along with an application fee of Rs 2000/-Candidates applying for both programmes need to pay only a consolidated processing fee of Rs. 3000/-. The fee can be remitted as an online transfer or sent as a Demand Draft in favor of “Media Development Foundation”, payable at Chennai with your reference number, full name, email id and mobile number written on the back of the DD. Last date for receiving applications is Monday April 8, 2019.